Arks Voyage is an Independent Travel Agency specializing in luxurious boutique experiences for one’s destination and doing meeting/event planning. Every person has a different definition of what luxury means to them, which is why Arks Voyage is the company to choose when you want to have a “priceless experience” when traveling or having your meeting/event spectacular. We offer luxury services, on top of exclusive perks from being a member of Virtuoso. Quality is our key element and our clients always come first. Established in 2018, our vision is to ensure every client has a very unique personalized experience whether it’s a solo FIT traveler, corporate, meeting/event planning, or a group of any size. We are not the company that will price match/beat the online travel giants of the world, but we ARE the company that will build the itinerary with creativity, passion, dedication, and quality assurance showcasing we care for our clients. The difference besides personalizing and connecting with clients, is we put luxury in everything. The power of sharing an elegant experience, especially when personalized, is how we want to inspire people to travel around the world sharing their stories or a meeting/event for a more memorable experience. There is a vast amount of excursions waiting to be personally explored by you! We are your key to opening the doors for memorable voyages throughout the world, contact us today! Your experience awaits, why wait? Arks Voyage offering Exclusive VIP Tables at Marquee SkyDeck for 2019 EDC in Las Vegas! Electric Daisy Carnal, aka EDC, is an annual party held throughout the world. May 17th, 18th, and 19th of 2019 will be held in Las Vegas, the entertainment city in the world! There are many inspiring DJs around the world that produce the most amazing music: Armin Van Buuren, Paul Van Dyke, and Time Penner to name a few. Tim Penner is from Canada and prior to beginning his weekly performance, about 85% of the time he has a motivational speech before the show begins. It’s DJs as Tim Penner that connect the entire world together through audio waves. Many times, those that appreciate music in any genre, can relate to this: Music is the tempo that bonds us and tells a story through audio waves. It affects us emotionally as we can connect with the different frequencies. EDC is one of many themed festivals hosted by Insomniac where ALL join for peace, love, unity, and respect; aka PLUR. This is an INCREDIBLE add-on value for the premiere party of EDC at the one and only Las Vegas! Are you ready for the PLUR luxury experience on behalf of Arks Voyage??? Contact us today for YOUR exclusive VIP table at the Marquee SkyDeck! More information about their show! Are you ready to see the one location to become the King/Queen of Instagram??? This very unique presentation is for everyone and all ages. Museum of Selfies immerses guests where those visiting can go into the history and depths of this new age of taking photos and its unique artists representation. Alfresco's rooftop movie viewing is back in production for their fourth season screening movies on the roof top of Mantalbán's rooftop. They choose a particular movie per viewing so this is a must do for movie lovers to be entertained in the heart of Hollywood. 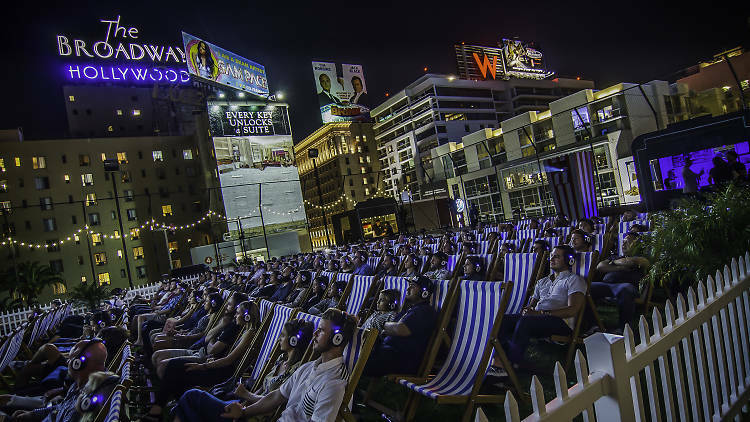 Rooftop Movie screenings and information!